If Britain does indeed vote ‘Leave’, and the gradual disintegration of the European Union were to gather pace, what would be left of ‘the idea of Europe’? What sense of collective identity and purpose, if any, predated the EU, and would it be strong enough to survive its breakup? The extraordinary complexity of European history and its multidimensional culture makes the character of any such common identity notoriously hard to articulate. But in these uneasy times, amidst the swirl of dark fears that the collapse of the EU would presage the dissolution of any wider sense of a shared ‘Europe’, it is a question worth asking. One classic answer, George Steiner’s newly republished 2004 essay The Idea of Europe, cuts through the infinitude of words that have been written about the pragmatic merits or otherwise of the EU – the transparency of its democratic and bureaucratic processes, the rights and wrongs of freedom of movement, the minutiae of its economic policy – to the deeper question of precisely what entity the EU represents: what is Europe, and why is it worth preserving? 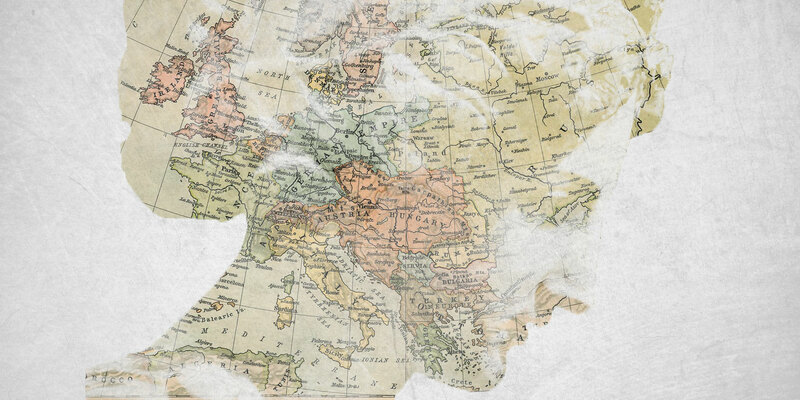 Steiner’s little book – just 48 pages long – draws on a lifetime’s immersion in European culture to suggest five constitutive elements of a distinct European identity. Some of Steiner’s suggestions are esoteric, but all are illuminating. The first is the distinctively European phenomenon of the ‘coffeehouse’. There’s an element of playfulness in the suggestion, but for centuries the European café has served as a critical gathering place for political activists, intellectuals and artists. This is a place where revolutions have been planned, masterpieces written, art manifestos drafted. The Jacobins plotted the French Revolution from the cafés of Paris, the Bolsheviks the Russian Revolution from those of Geneva and Saint Petersburg. Ideas shared in the coffeehouses of Vienna, Venice and Rome – and Edinburgh – have all been fundamental for the flourishing of European culture. Steiner’s second touchstone of European identity might seem equally obscure: a timeworn obsession with walking. But until the modern age of mechanised transport, the willingness of Europeans to walk numberless miles for the sake of cultural and commercial exchange with others was fundamental to the evolution of European culture. Europe’s relatively benign climate and geography – there are no impassable badlands, deserts, forests or mountain ranges (even its Alpine passes are well trodden) – has always made it possible to cover the continent by foot. For millenia Europe has been an intimate network of settlements – as Steiner puts it: ‘The voyager seems never to be altogether out of reach of the church bell in the next village.’ The assurance that ‘Europe’ can be navigated on foot has been critical for the formation of the perspective that – amidst all its diversity – this is a distinct place, a shared land. Indeed the image of the wayfarer is central to European culture, from the wandering philosophers of the ancient world, to the reveries of Rousseau and the Lake Poets, to the songs of Schubert. Steiner’s fourth benchmark is perhaps the most fundamental of all: European culture’s age-old, ongoing negotiation between the ideals of speculative reason and religious faith, the double inheritance of the legacies of classical Greece and ancient Israel. Radiantly useless, often profoundly counterintuitive, these three activities are unique to men and women and come as near as anything can to the metaphoric intuition that we have indeed been created in the image of God. And yet, unfathomable as that legacy is, it has always existed in tension with a rival imperative, that of faith and revelation, the great Hebraic concepts transmitted to Europe through Christianity: ‘the definition of our humanity as in dialogue with the transcendent, the concept of a supreme Book, the notion of law as inextricable from moral commandments, our very sense of history as purposeful time’. Even as Christian belief has declined across Europe, Biblical notions continue to suffuse secular thought: Steiner mentions Marx, Freud and Einstein, secular Jews whose work shapes modernity itself. Marx’s concern with social justice and the idea of a final revolution draw upon the prophets and Messianic expectation. Freud’s assumption of an original crime – the killing of the father – is rooted in the myth of a fall from Eden. And even Einstein’s trust in cosmic order owes something to the monotheistic conviction that reality is anchored in a transcendent God. Much of the best European thought has been shaped by the attempt to navigate the competing imperatives – for they can never be finally reconciled – of philosophic-scientific reason and of faith and revelation, Athens and Jerusalem. It’s a tension manifest in the pages of New Testament itself in the letters of Paul and the ‘Greek’ Gospel of John, in Catholic theology’s dialogue with Aristotle, and the Florentine Renaissance’s attempt to Platonise Christianity. It’s a sense of foreboding that owes much, of course, to the Christian expectation of a Second Coming. But religious belief in an end of days has its secular analogue in a wider European preoccupation with the idea of decline and fall. Intimations of an impending doomsday find ever new expressions, showing up in the burning landscapes and cities that have long preoccupied Europe’s artists, the pessimistic histories of Gibbon and Spengler, and recent concerns over nuclear weapons, climate change and mass migration. Europe is the place where Goethe’s garden almost borders on Buchenwald, where the house of Corneille abuts on the marketplace in which Joan of Arc was hideously done to death. Viewed in terms of the broad, bloody, canvas of European history, the EU can be be understood as just the latest project to pursue an ideal of unity, a collective effort dating back at least to Charlemagne to establish the terms of a lasting peace. It may be that the future of the ‘idea of Europe’, if it has one, depends less on central banking and agricultural subsidies, on investment in technology or common tariffs, than we are instructed to believe. It may be that the OECD or NATO, the further extension of the Euro or of parliamentary bureaucracies on the model of Luxembourg are not the primary dynamics of the European vision. Or if, indeed, they are, that vision is hardly one to rouse the human soul. In a world now in the grip of murderous fundamentalism, be it that of the American South or Midwest, be it that of Islam, western Europe may have the imperative privilege of hammering out, of enacting a secular humanism. If it can purge itself of its own dark heritage, by contronting that heritage unflinchingly, the Europe of Montaigne and Erasmus, of Voltaire and of Immanuel Kant may, once again, give guidance. Religious dogmatism is not the only fundamentalism Steiner has in mind. He concludes his essay with the rather nebulous hope that ‘Europe will generate a counter-industrial revolution even as it generated the industrial revolution itself’, will offer some resistance to the encroachment of market fundamentalism with its creeping commodification of every aspect of life, will make space for the practice of free intellectual enquiry and artistic expression. It’s an unashameably elitist vision, perhaps, the thoughts of another tenured academic protesting the creeping utilitarianism of modern life. As Steiner himself writes: ‘These are dreams, perhaps unforgivably naive.’ But in these unsettled times, in a Europe ill at ease with itself, it is perhaps necessary to be prepared to dream a little to discern what it is about ‘the idea of Europe’ that is worth holding on to. The Idea of Europe by George Steiner is published by the Nexus Institute. Justin Reynolds is a designer and writer living in East Anglia.